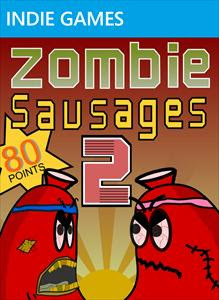 Back at the start of 2011 I had the misfortune to play a hideous game by the name of Zombie Sausages. Later that year a sequel was released, only now two years later have I plucked up the courage to play the demo of it. Much like Zombie Sausages the game takes place in a world where giant zombie sausages are walking around in large numbers. These zombies number the thousands and seem aimless. Humans are mingled in with these and seem not the least bit concerned about events. The tune this time around is quite catchy, so a good start. Again you have the option of a firing range style game and a sniper based one. A threat level meter slowly builds up on the right hand side, if it gets to the top it is game over. You can collect extra weapons and ammo by shooting items connected to floating balloons. The motif appears to be that of a fairground. 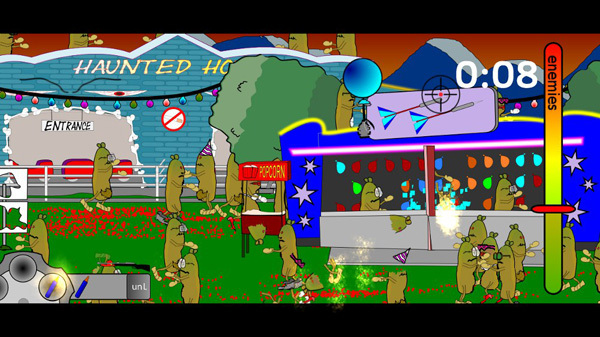 The first level took place at a bands stage, the next level was in front of a haunted house attraction. I gave the original game the lowest score possible, I don't know why but I found this one less offensive. The sausages still do not look like zombies at all and it is quite boring but is a slight improvement and at the very least is bright and colourful.